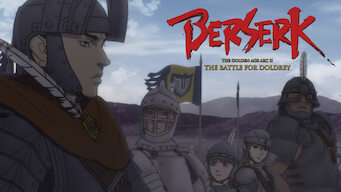 How to watch Berserk: The Golden Age Arc II - The Battle for Doldrey (2012) on Netflix Netherlands! Yes, Berserk: The Golden Age Arc II - The Battle for Doldrey is now available on Dutch Netflix. It arrived for online streaming on March 8, 2019. We'll keep checking Netflix Netherlands for Berserk: The Golden Age Arc II - The Battle for Doldrey, and this page will be updated with any changes. For three years, Guts believed his mission was to pursue Griffith's dream together with him. But in order to become Griffith's equal and truly be called his friend, Guts realizes he will have to leave the Band of the Hawk. After falling in with a band of rebels, a loner starts to see that he may need to go his own way once more.